Our sorrow knows no boundaries. Through this darkness we appreciate all the kindnesses, generosity, support and love given to us by Ethan’s and Xena’s friends and colleagues. We thank all of you for everything you’ve done. Let us all keep in our minds and hearts Ethan’s example and energy and skill so that we can grow better and not let his life be in vain. Ethan Thoreau Johnson died September 21, 2010 of head injuries sustained in a hit and run automobile collision near his south Minneapolis home. He was 37. Ethan was a research scientist at the University of Minnesota, where he studied the biochemistry of photosynthesis. 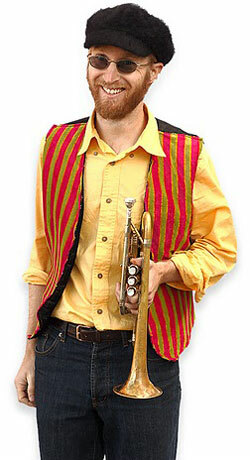 He played trumpet in a local band, the Brass Messengers, and was an active member of the Minneapolis puppet community. A multi-sport athlete and outdoor adventurer, Ethan competed in cross-country ski races, had run marathons and, in high school, won the Idaho state soccer championship. In summer, Ethan and his wife made long, unsupported canoe trips through the Boundary Waters Wilderness. He commuted by bicycle year-round. Ethan had wit, intelligence and curiosity. He was a natural experimenter, an entertaining storyteller and a patient teacher. He was kind and gentle but also mischievous. He made time to be with his family and friends, and he had fun. He is deeply missed. Ethan was born in Albuquerque, N.M., and grew up in Montana and Idaho. He earned a BA in physics from Cornell University and a PhD in biochemistry from the University of Washington. He and his wife moved to Minneapolis in early 2005. Ethan is survived by Xena Huff of Minneapolis; his father and stepmother, Stephen and Susan Johnson of Missoula, Mont. ; his mother and stepfather, Beverly and James Smith of Woodway, Texas. ; his sister, Erica Johnson of Spokane, Wash.; stepbrothers Mark Smith and Eric Smith; stepsister Kathryn Aber; and numerous aunts, uncles, cousins, nieces and nephews. A memorial service will be held in Minneapolis 7 PM, October 13, 2010 at the Cedar Cultural Center, 416 Cedar Avenue South. More information is posted at ethantjohnson.com. Donations in Ethan’s memory may be made to the University of Minnesota Department of Biochemistry, Molecular Biology and Biophysics; the Brass Messengers; or BareBones Productions. Photos of Ethan. Hover over the photo to view thumbnails and controller. We will add more if you can send some using the form in the right column. Please note that we won’t be able to list a title or photographer’s name on this page. Click here to visit the full gallery with thumbnails. Comments and photographer’s notes can be added there. You can also download photos there. Also please send links to other online galleries you may know about. Thanks. This site was built to honor and remember our beloved friend, colleague, husband, brother, and son, Ethan Johnson.